HomeNew Products Draw yourself HAPPY! Current medical studies show how chronic stress negatively impacts health, potentially compromising numerous systems in the body and leaving us more vulnerable to a host of health issues from infections to insomnia. This means you are leaving yourself open for disease and illness—just from being stressed out. While everyone’s stress tolerance is different, common day to day stresses are around every corner for all of us. Now, here is the BIG question: Do YOU enjoy drawing? I didn’t ask if think you are the next Picasso, or if you were any good at it, I just want to know if the act of drawing appeals to you. Why? Drawing effects the brain in a way that music, reading, sports, singing, or nearly any other activity can induce. The act of drawing effects your brain in a way that can increase a lot of positives attributes. Check out the benefits that drawing has on your brain. It can actually add synapses to your neurotransmitter. This means that memories and experiences stored in your brain can become stronger, more vivid, and easier to access. Drawing increases many of the cognitive functions that researches typically label as the ‘creative’ and ‘right brained’ activities. Produces positive brain chemistry like Serotonin, Endorphins, Dopamine, and Norepinephrine. Happy brain chemistry! Your brain stem can actually get thicker. Your awareness of your surroundings can get sharper. Your memory can improve. This gives you a better visual or photographic memory. It produces an overall state of alertness that all of your other brain functions can use for improvement. Drawing clears your head and lifts your attitude up. When you draw, dopamine is released, this is your HAPPY. Dopamine is involved in the brain’s reward system, which also is the system associated with increasing creativity and lowering inhibitions. No wonder it is fun and exciting to draw! 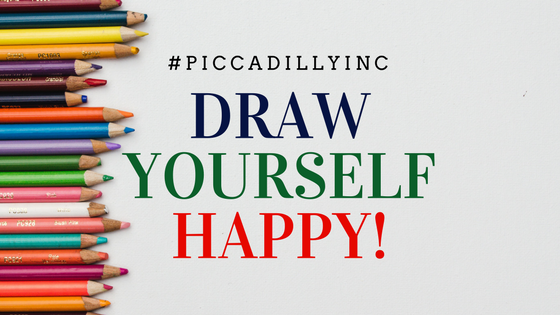 Not only can drawing make us feel happier, it is also a way to better understand yourself and what makes you stressed out or uneasy in the first place. Visual expression (drawing) can help us get past our inner censor and open up our minds to let go of thought blocks. Working visually, we can access our unconscious with greater ease, where we can find out more about our true selves. This act of digging deeper into our unconscious sounds a bit unnerving, but this action can help you leave painful items from your past in the past and move forward. Even if the painful item is failing a midterm or getting fired—it can really help you find your happy place. Check out our line of sketchbooks and drawing journals here.